He paints because he has to paint. He sees the world differently than I do and he has this relentless flushed urgency to try to capture what he sees in oil paints, thickly applied sometimes, on blank canvasses. Lately he has been sitting in his cold studio, hunched forward, working with these crazy translucent red paints (rose madder and alizarin crimson), this slash of red that stands out in winter grey around here. His art teacher 30 years ago told him that no one should ever use this particular red. So John bought a tube  expensive for 1979  and saved it, all this time. He said he wasn’t ready for it before. He didn’t know enough yet. He opened the tube this winter. I haven’t seen this painting yet. I can’t wait. Forgive me. I know you loaded up this site hoping to find cinnamon rolls. And there they are! See them up there? Lush and delicious, soft and inviting. The recipe is at the bottom of this post. If you really can’t stand it anymore, skip these words. Click on the part that says “Keep reading” and it will all be there. You don’t have to read this at all. You see, I can’t draw stick figures in any recognizeable fashion. My mother bought me a set of paints or watercolors or oil crayons every Christmas, hoping that the artistic talent would bloom some late December. It never did. I’m no visual artist. Lately, however, I gobble up light with my camera, not wondering if I’m a good photographer, just wanting to see. I write little messages on Twitter because my fingers twitch if I go more than a few hours without recording what I have noticed. I write letters to friends on small stationery cards and copy them before I tuck them into envelopes, saving the copies in a folder for sometime later, in case I ever wonder what I was doing this second day of winter, 2009. I don’t know what I call this. I just do this. Nearly every afternoon, I open the cupboard with the gluten-free flours and grab corn flour or potato starch. Sometimes sorghum. Sea salt, baking powder, and xanthan gum are in the cupboard next to the dishwasher. I reach for the butter that has been softening on the counter so I can mix it with brown sugar and start the magic happening. I never know what’s going to happen next. I imagine it. I know the general structure. But lately, that countertop in front of the bay window, with Little Bean beside me, has become my blank canvas. I’m inventing as I go, trying to make the soft sweet treat I imagine happen underneath my hands. For Christmas, I wanted cinnamon rolls. Tell truth, I have made them every Christmas for the past four years. The first year’s were awful: gnarled at the edges, a bit burnt, and dry as insulation material. The second were from a mix. The third year…Did I make them the third Christmas? I was 8 weeks pregnant, sleeping and sick most of the time. It’s a bit of a blur. Last year, Danny and I proudly carried in the cinnamon rolls we had created for the first draft of our cookbook. And they were….good. I mean, really good. But not, great. No, that’s not it. They still didn’t match the image I had in my mind of what a good cinnamon roll should be. I want a soft, pliable dough, one that tastes good on its own. Yes, I love plump golden raisins, brown sugar almost melting, the ooze of cinnamon-scented butter on the edges, and cream cheese frosting. Really, how could you not love cream cheese frosting? But most of all, I want a cinnamon roll that stands up to the rush of Christmas morning, with a few stragglers left until the afternoon when we pick at the caramelized edges to stave off the hunger pains until dinner begins. I want the cinnamon roll you see above. And I need it to be gluten-free. A few days ago, I finally baked it. As you may know, I have been baking cinnamon rolls non-stop for the past few weeks. I learned so much from every batch, from the botched to the beautiful, that none of it has been a waste. Seriously, though, I started growing close-throated at the idea of another cinnamon roll. Time to bake something else. Oh. It never occurred to me, somehow, that a cinnamon roll dough is a white bread dough. (I’ve been studying cinnamon roll recipes like they are the Torah. No one mentioned this.) Strange as it may be for a gluten-free girl, the white bread dough didn’t intimidate me. I’ve figured that out lately. I knew it under my hands as I mixed and rolled. This was the one. You can see the pictures here. 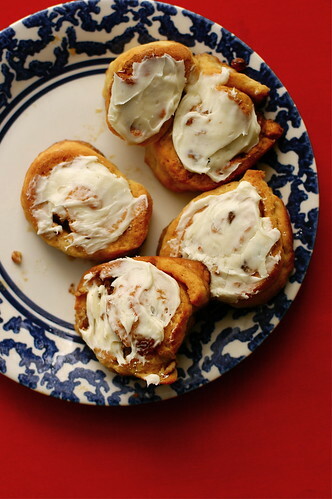 Let them be the judge if you would like to bake these cinnamon rolls too. That’s the thing. My cinnamon rolls may not be the ones you like best. That’s okay. Not everyone loves John’s paintings. (I don’t understand those people, but fair enough.) There’s not a single creative expression that will win universal approval. That’s not why we do this. That’s what I’m always doing, when I write, whether it’s letters or books. I’m just sitting here trying to write what I wish I could read. And now I’ve created the cinnamon rolls I wished I could eat. If you enjoy them too, that’s all the better. You’ll see that I have given the flour measurements here in ounces. I bake by weight, with a trusty scale, spooning out flours to exactly four ounces. It makes baking more precise, which is vital to gluten-free baking. It also, however, makes it liberating. Once you figure out the ratios, you don’t need someone else’s recipes. You can make it up on the spot. That’s my hope, that enough of you start baking by weight that you won’t even need to look at my recipes. We can just have conversations instead. I know that some of you will ask about substitutions. I don’t know. If you can’t eat almonds, or have an allergy to corn, or have just run out of potato starch, you can substitute other flours, if you use the same weight as the original. I’ve used brown rice flour, sorghum, teff, and arrowroot powder successfully here too. The ratio is what really matters. Now, personally, I probably wouldn’t use any of the bean flours in cinnamon rolls, or mesquite, or anything that smacks of healthy eating. It’s a cinnamon roll. Let it be starchy and doughy for one day. These cinnamon rolls can be dairy-free, as well as gluten-free. In fact, the rolls you see here were made with goat’s milk powder, so if you need to avoid cow’s milk, this is your recipe. You could substitute soy milk powder or rice milk powder, if you can find it. Other than that, I really don’t know. I’m pretty darned happy with these cinnamon rolls. They’re gluten-free. That’s how I need to eat. If there are ingredients here you can’t eat, then it’s your turn to adapt this recipe and make these the best cinnamon rolls for your kitchen. Activating the yeast. Bring 1 cup of the water to 115°. This is a good temperature for yeast  not too hot, not too cold. If you want to be particular about it, you can use a thermometer to measure the temperature. I like to turn on the tap water and run it over my wrist. When the water feels like the temperature of my skin (with no cold splashes or hot pockets), it’s ready. Mix the water, yeast, and sugar in a medium-sized bowl. Set it aside to rise, about 15 minutes. Can you be my mom? Or at least move near me? I seriously am drooling here! I cannot wait to try this recipe! Great post Shauna! I'm too nervous to try this recipe for Xmas morning since I've never made it before. I have no doubt that it's amazing! More, I doubt my ability to replicate it. But once I'm back from my family's, this is the first recipe I'm trying! They look beautiful! I agree, I wouldn't use any whole-grain flour substitutes in a recipe like this. That's just asking for hard cinnamon rolls. I've just started measuring with a scale, too. I've done a bunch of experiments with measuring things out more than once and weighing them. The measures come out differently every time! No wonder my recipes always varied. Now I feel very professional when I weigh out my flours. It's so accurate! Unbelievable. I can't wait to try this recipe for a gluten free friend and a dairy free sister in law. Stumbled. Thanks to your prompting, I have also become a fan of baking using a scale. So when my parents asked what they could get me for Christmas, I jumped at the chance to ask for a digital food scale. Lucky me, it arrived all fancy, new and prettily wrapped the next day. That day, I made the best batch of Christmas fruit mince pies I have ever tasted, using weighed dough ingredients. I know exactly what you are talking about. I also bake and photograph because I have to. I have to purge all these ideas that float around my head constantly. My father is also a painter. Has never had any recognition despite his exhibitions but he keeps at it… Because he has to. I love that idea of something greater than our will pushing us. Shauna, I am making these this weekend. I am an amateur GF baker. I feel intimidated once again… Just like a young apprentice. I love it! I'm glad painter John bought that tube of red paint. Okay, it's cinnamon rolls for me this week. Your artistic visual style looks good enough to me. I can't look at your cinnamon rolls without drooling. I am in Iris's camp, too nervous for Christmas but Iris did you try the Rugelach? I think this is a no brainer unless you have never worked with yeast like myself. I am going to talk the household yeast queen into helping me with these tomorrow morning instead of GF pancakes. May I suggest a future topic for a post! A general tutorial on the properties of the flours we used. I am not sure I really understand the difference between "meal" and flour for example when considering the nut flours. Corn flour, corn meal, corn this corn that, what does it all mean! I would love recipes posted not only by weight but the brand of flour you use, or if you grind your own how you do that! I know, great idea for a post right? In the mean time I hope you have a wonderful Christmas and a joy filled new year! Merry Christmas to you and your wonderful twitchy fingers! And as for those cinnamon rolls, I know I'm not the first one to say it, but clearly you're a magician. seriously. over here close to weeping in my little cubicle in the Hiveworld that is social services. they look beautiful . . .
i've been trying to explain to people for years how difficult it is to be allergic to gluten. can't have the pizza, subs, brownies, cookies the bosses and coworkers bring in. can't have the birthday cake at parties. can't eat 9/10s of the stuff at dinner parties. can't order dessert out at restaurants. it's hard to explain to people how sad this can feel. sweets are a treat not just to the stomach and brain but to the heart. and while the new wave of gluten free products are decent, none really, truly make the heart sing. Thank goodness – we don't have cup measurements in Europe and I have no idea how you're supposed to measure a tablespoon of butter. I've always weighed everything because I was taught that baking is precise…. so I've been having a miserable time with recipes asking for cups / sticks of butter etc..!! And I love the idea of cinnamon rolls – thank you Shauna. As a Brit, thank you for moving to weighing! I always bake like that. My son is only 10 weeks old so I can't tackle these yet but I will! One question-what weight is a stick of butter? squeeeeee! i cannot wait to try these! i think i can use soy milk powder, egg replacer, and some other vegan goodies to make it vegan – i cannot wait to give it a whirl. thanks so much for the wonderful recipe; your cinnamon rolls look divine! Hi jessy, did you make these vegan. That is one thing that gets to me, a lot of recipes call for egg!!! I would use soy powder too. Thank you so much. Christmas morning will be like old times. I can't wait to try these. This recipe is a wonderful gift. Thank you! Thank you! Joy! Joy! I hope your holidays are delightful! Rock on! 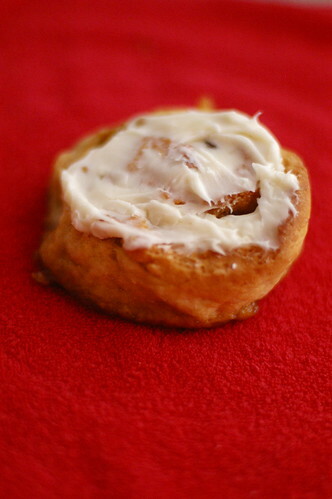 Thank you so much in your persistence to create GF cinnamon rolls…no easy task! Can't wait to try them soon, temporarily "baked out". Did make your amazingly brilliant cornbread the other night and it rocked with our chili! Thank YOU! Though I'm not gluten-free, this is why I come back to your site again and again – wonderful story and insight Shauna. The cinnamon rolls look delicious as well! Shauna, I've been reading your beautiful, heart-felt words for the past five months since I started traveling this gluten-free path, but I've not commented until now. I have tears in my eyes from reading this lovely post. Truly, the cinnamon roll recipe is a wonderful gift, and I thank you, but you have given oh so much more here. I've seen you write several times lately "This is my life now." And that is what I love most about you. You are here. Now. Making the sweetest lemonade of your life from the lemons you've been handed. You have taken the reins and galloped boldly ahead without looking back with regret or anguish, somehow knowing all the while that gluten-free is not a death sentence if you choose not to make it so, but instead that it can be a liberating, creative adventure. That has helped me more than you can ever know and, undoubtedly, countless others as well. I will make these lovely confections, and I can already sense from the recipe that they will be incredible. But what I will savor most is the gift of yourself that lives in all the love and energy you've put into creating them and how, without ever having met you in person, you have brought such hope and sweetness into my life. Merry Christmas! "I'm just sitting here trying to write what I wish I could read. And now I've created the cinnamon rolls I wished I could eat." And you're the sweet, genius friend I wished I could have. You are a treasure, Shauna dear. Thanks for the rolls, the words, and the cream cheese frosting on the cake of life! — What brand of almond flour did you use, and do you think that matters? — Do you think it is OK to make these the night before and do the second rising (in the pan) on xmas morning? I'm so glad your cinnamon rolls finally turned out! Congratulations! I just finished baking a batch of my favorite cinnamon rolls (and taking them to the neighbors' so we don't eat them all!) Then of course I had to have a bowl of oatmeal to counteract all the sugar. I think I'll make these for an early morning work meeting next week, thanks for all your hard work on this recipe. Shauna – these look great. I love your experiments – and your honesty. We all appreciate it! 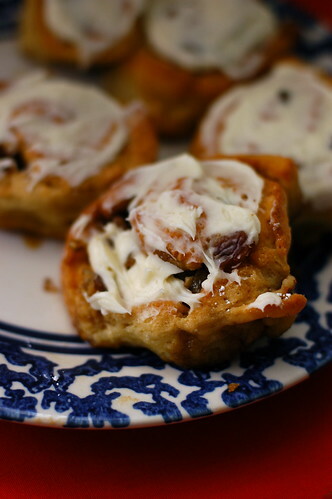 I made GF cinnamon rolls several years ago (posted at my blog). But since then, I've gone egg and dairy free, so I would like to try and make them without eggs or dairy. Wish me luck! Your persistence is a model for me. Many thanks! I'm squealed in delight when I opened this post. Yippee, you did it! Cinnamon rolls in time for Christmas! I am tickled Shauna, that you took the time to make these perfect. Thank you for your diligence through the trial and error. And thanks to Little Bean for taste testing all the versions before this for us! I have been reading your praises for the kitchen scale and I have to say I would agree at this point. I made our favorite cornbread recipe in a gluten free and with gluten version for a winter solstice meal. I wheighed the flours to replace the all purpose flour in the recipe: amaranth, sorghum, teff, potato, and tapioca. I used hempmilk instead of cow's milk. The verdict was that the gluten free cornbread was the best anyone at the table had ever eaten. People who can eat gluten were eating the gluten free version by preference and coming back for seconds and thirds. The only difference between my past attempts and this was the kitchen scale. Now the cornbread of choice in our household will never again have gluten in it. Cornbread with wheat flour has not taste compared to the combination above. I've been quietly anticipating your cinnamon rolls with everyone else. Seeing them brought a huge smile to my face. Seriously, after being gluten-free almost four years now, I've missed cinnamon rolls the most! And I'm dying, because I don't own a proper measuring cup, let alone a scale. I have a food processor and a whisk, but no other electric mixers of any kind. I feel like your painter friend buying that tube of inexplicable red with this recipe. (smile) I know it is beyond me at this time. I fervently wish I had a painter/baker of your caliber at my disposal! Since I'm not patient, I guess I will have to train up and save my pennies. This recipe will be waiting for me until then. I'm glad of it. Thank you Shauna and Happy Holidays to you and your family. Where can we see John's paintings? Does he have a web site? Oh Shauna (and Danny and Lucy) – I love your stories, I love your recipes and I love your persistence – I have always baked (for close to 50 years!) and have a treasure trove of my own and my Italian and Polish nana's and my mother's recipes that I have used over the years – for the past four years I have also experimented to make them gf. My pizzelles are awesome, and so are many of my standard cookie/cake/and bread recipes – now I can add the rugelach (very similar to my Polish nana's nut horns) and cinnamon buns. Thank you for your experiments, tips and encouragement. I, too, got my little one (she's now 23!) baking and cooking at a very early age, much like your little one, and she is such fearless cook and baker (vegan is her niche). It is so heart and soul warming to read your blog – our warmest wishes for a happy holiday season! Shauna & Danny – Thank you for these cinnamon rolls – I know they're going to be amazing. I'll be ringing in the new year and making these for our first meal of 2010. BTW – the rugelach. Amazing. Best GF pastry I've made yet! Blessings to you and Danny and Lu this holiday season! Just fantastic! I love the story and the sound of these rolls! I love it when a friend has the obvious, holy grail answer, it always makes it more fantastic =D. Thank you to both of you for this great recipe and all that you are sharing with us! Happy Holidays and looking forward to reading more! I never post, but these are inspiring. My son & I are both gluten intolerant. My family gets it, but doesn't alter their holiday meals for us and it can be so hard to watch all those wonderful, familiar foods set out on the table and breathe in the smells that say Christmas morning and know if you eat it, you suffer. So today, for the first time I am going to make something that excites me to be baking AND will be so good I bet they ask me to make them every Christmas from now on. Thank you for sharing your journey Shauna. Your passion for real food and not sub standard gluten free substitutes is giving me back my passion in the kitchen. Picture this 1973 – Redbook magazine features Vashon families celebrating Christmas – a recipe for a sweet roll is featured…it was a saffron roll – it seemed dry looking and not appealing but saffron…hmmmm cinnamon rolls….yes! So I started making them that way- my family practically demanded them every year after that. Saffron is expensive so now the gardener, I grow it too- One of my favorite scenes from Savauer mag is a group of Spanish women sitting around a table taking the little stamens off the saffron crocus and piling them onto plates. You know I have not made them for a few years now- and you know what else? – I am going to do just that for our family gathering. Shauna is the one who is somehow always the inspiration for me. Made these today. They are fantastic! But Shauna, who are you kidding? "Wait 10 minutes, invert on a plate, frost when room temperature." HAHAHAHAHAHAHA! The first pan didn't make it 10 minutes….all gone. And the frosting melts when they're warm! Cinnabon, eat your heart out!!!! I've been checking for the recipe for the last few days and tried it this morning, for those interested…I substituted 2 oz amaranth and 2 oz sorghum for the almond flour and added 1/2t cinnamon to the dough. Now, I'm a pretty good bread baker, but this dough was a little too soft. It rolled out easily but was too sticky and it stuck to the parchment. I tried greasing the parchment and no luck, too sticky. So, the first 'roll' looks like a misshapen (but great smelling) bread loaf, and with for the second half of the dough I made a layered loaf, with three dough layers and two cinnamon layers. Placed both in a 1/4 sheet pan lined with parchment. They're in the oven right now, and smell amazing! …OK, they're not done, but I just cheated and pulled off a corner…YUM!! Thank you for helping me and my son have cinnamon rolls this Christmas!! I'm so excited. I just now put the cinnamon rolls in the oven and I can't wait! I've been off this week so it's been so nice to just enjoy baking at my leisure. Thank you for that recipe and also the detailed instructions. It's made my week. As a person recently diagnosed with a gluten allergy, I am excited to find your blog. Can't wait to make your peanut butter cookies especially! I'm a mom of a ten year old who has an autism spectrum disorder. People would considered him to have high functioning autism. I've heard a lot surrounding autism and gluten allergies, so I decided to eliminate gluten from his diet. I'm happy to state that I've seen a difference in his ability to communicate. He engages in conversations now and is showing a sense of humor. I'm also happy to have stumbled onto your website and blog. I'm looking forward to trying the cinnamon roll recipe and it sounds like I may need learn about cooking with a scale. I would like to be privileged enough to see John's paintings. These are AWESOME – thank you so much, we had them for Christmas breakfast/lunch. I just made them… Laboring over my husbands love of gluten and my own non-gluten needs, I produced both today on Christmas. Needless to say, the GF are better and lovely in presentation. I didn't have enough room in my baking pans for both, so I slipped a few homeless GF cinnamon rolls into a muffin tin, creating a new personal favorite, GF cinnamon roll muffs. Thank you for the lovely recipe, they were quite good. Two questions, what is corn flour? I didn't have any so I used millet. Second question, asked previously, do you think you could refrigerate the dough and do the second rise in the morning? Thanks again, your recipes have been a lifesaver! Now I want to see some of his artwork. Can you post a pic to your site? Looks awesome! I'm not gluten-free, but I'm AMAZED at your passion and ability to convert reipces for folks who are…and I'm going to try these regardless 🙂 Lovely writing/story, as always. Happy holidays! These look just brilliant. 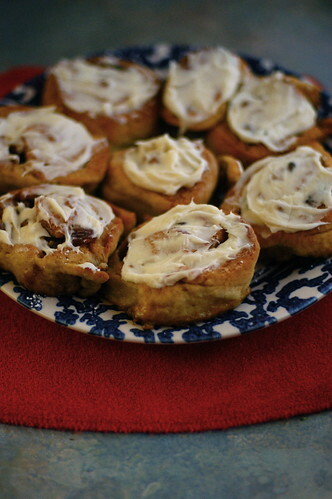 Cinnamon buns are a must for the holidays around here! Happy Christmas! The cinnamon rolls look great; very tempting! I may not be the best baker but with recipes like these, i might be able to make my own cinnamon rolls. I love this post. The cinnamon rolls look amazing and I'll try them – I'm new to Gluten free and so this will be exciting. But now I also want to see John's paintings. You said he painted because he wanted to, he needs to. I can't think of a more important reason than that to do anything. And alizarin crimson is a tough one, difficult to cover, brash, not light friendly, yet I have the feeling John is ready for it. Thank you. This was a wonderful read. i love john the painter and i'm a fanatic about cinnamon rolls. These gluten free recipeas are great. People in my family have gluten allergies and I have been sending them over to this blog. don't suppose you'd know how to make a gluten free blueberry cobbler? Where do you get your Xanthan gum? I've never seen it (in the UK) – not even in our local Asian stores which often stock very unusual things. Also, is it essential? Can the dough hold together without it? Love the look of those buns (wink! ), but what I loved even more was your discussion about your friend John and art. I am an artist too and have recently left full time work for the life of a painter. I started a blog about my process to help me understand it better and to help me get into the swing of things again. I would love to talk to John who seems as blindly and passionatley commited to the process as I am (even without totally understanding it! )And when I just can't paint anymore? I bake. Thanks for being so inspiring, not just with your gluten-free cooking, but with the stories in your life. They look delish, Shauna. Does John have his work online? If he does I'd like to see his blog or website. I too have been wrestling with gfree bread and roll recipes for a while and have tried a number of combinations and I was just wondering why you used milk powder instead of milk. Don't gf baked goods always need a helping hand with an extra bit of liquid? Just noticed liz's comment. You can get xanthan gum in the supermarkets. Maybe Sainsburys or Waitrose for sure. I'm sure I've even spotted it in Tesco. Whereabouts do you live? Thank you so much! I was very brave and made your recipe for my family Christmas morning. Four of us are gf (my mom, my husband, my toddler niece and me) so this really was a special treat. I realized too late that I was out of tapioca flour so I substitued teff flour. I think that made the rolls a little heavier, but the flavor was awesome. Everyone loved them, even the wheat-eaters! Rolling up and cutting the dough was way easier than I thought it would be, and I kept exclaiming to my family, "LOOK! LOOK! Cinnamon ROLLS! They are in actual ROLLS. Aren't they beautiful?" The smell that filled the kitchen while they baked nearly brought tears of happiness. I decided to bake just the first eight rolls on Christmas morning since there were only six of us and we had a ton of other food. I set the other eight up in the pie pan and stuck them in the fridge to bake the next day. Oops…I'd never worked with yeast before, so I didn't know that you shouldn't put dough in the fridge after the second rise or it will fall. But they were still yummy when I baked those the next day, just denser. We also tried the first set with a glaze, but after doing the second set with the cream cheese frosting we all agreed that the heartiness of the roll tastes better with the tang of the cream cheese. They were truly delicious and I had a lot of fun making them. I think a new family tradition (or, rather, an updated and reinvented return to the tradion of canned cinnamon rolls from my childhood) has been born. Thank you again! One of these days, when I have apples in the house, I'm going to make a dairy-free version of these with tiny bits of chopped apples mixed into the filling. My first go-round with a dairy-free version will be to use soy milk in place of the water and milk powder. Not perfect but might just do the trick. I read your site often, have tried several of your recipes but rarely comment. But I have to comment on this post. Today I had my first cinnamon roll in six years. It was incredible. Every bit as good as one with gluten. Thanks so much for all the work you put into that recipe. I really appriciate it. I've never had any gluten-free cinnamon rolls. They look so delicious! Oh my, These look so fantastic. Thanks for sharing your gluten-free cinnamon roll journey. I just made these, and they're amazing. everything that could go wrong went wrong: I started too late and had to leave in the middle, my foodprocessor broke down while I was trying to turn my almonds into almond flour. I ended up using chopped almonds, so the dough didn't rise. Also, I ran out of maple syrop half way through. never even managed to roll these or cut them. I just baked a big gooey lump with oozing filling… the best I've had. Really, I can't imaging someone ruining this – Not possible. These are simply amazing! I made them, successfully, last week and they moved me. You are right, this is the closest thing to the gluteny-thing. I have missed cinnamon rolls dearly and this totally filled my need. I don't have time for much experimenting right now so I am grateful you worked so hard to make such a great recipe. I accidentally proofed my yeast with all the water, but didn't realize it until I had added the wet and dry ingredients together. On that particular day I think I would have needed less water (it was raining outside) so my dough ended up being a little sticky and tricky to roll. But I persevered with patience and was rewarded! I am making another batch for my upcomig girls weekend. They are all glutenous so I will let you know what they think. Thank you, thank you, a million thank yous! Just found your blog, its gorgeous. Its funny you mention the white bread thing because I make cinnamon rolls with my grandmother every year for xmas morning. Last year I told her I wanted the recipe, so was we were making them, she was copying me the recipe. Afterward she handed me the recipe card and the top said "dinner rolls" and it was just that. She knew all the steps to turn her mothers dinner roll recipe into Cinnamon rolls. Delightful. I am glad to have this gluten free version as a lot of my friends are gluten intolerant. Love your blog. Last Christmas I tried to make gf cinnamon rolls using a bob's red mill bread mix, but somehow (wasn't wearing my glasses?) didn't see that it was a garlic and onion flavor bread mix. I topped them with cream cheese icing hoping to drown out the onion flavor but it didn't work. Needless to say, they became wonderful hard, oniony dog treats. This recipe gives me hope! I used this recipe to make a King Cake! To make dairy free, I substituted 1 1/2 cups of hazelnut milk for the water and milk powder; coconut oil for the butter. Replaced corn flour with amaranth flour (didn't have corn flour). Placed overnight in fridge after shaping for second rising. Took the rolls out of the fridge in the morning just before pre-heating the oven and baked for just under 30minutes………yummy! But maybe a few minutes less next time. THANK YOU for the amazing recipe! This is the first gluten-free yeast bread with which I have been successful. Such incredible rolls. I blogged about my baking experience with them this week and could have rambled on forever; they are THAT good! And thank you for being a constant ray of sunshine in the gluten-free world. I am so grateful for your knowledge and sharing in my relative newness to eating gluten-free. I am a painter and a foodie. This post touched me, right into the depths of my heart and gluten free stomach. I find cooking just as much of a creative outlet as painting. I'm just like you when I cook, a bit of this a bit of that, you just FEEL it. Get to know these new flours, and get excited about them. Same goes with painting. I have no formal training with oils, I just began experimenting, mixing the paints with my brush (just like you aren't meant to…) and probably using the wrong number of medium for the layer I'm working on… Nobody can tell you how to create! As long as you feel that rush, your heart stops for a moment and goosebumps appear on your skin, then you think, "I got it!" There is no better feeling. Please keep experimenting with your food and words and photographs, and unknowingly you will inspire somebody you probably don't even know, just as you did with me. I have successfully made the rolls (!! ), used some teff and sorghum, used Vances Dairy Free powder for powdered milk and Earth Balance Buttery Sticks for butter to make them gluten and dairy free for my kiddo w/ ASD. Saving them for tomorrow but my husband snuck one and said they are good, without frosting or icing of any sort! Wil freeze a few and save for Easter morning. Thanks for the inspirational recipe. I made these yesterday morning, for Easter. We had been invited to brunch at a friend's house. I have a reputation as a good baker, and I wanted to bring something special. But, both my friend's two year old daughter and her mother are gluten-intolerant. So, knowing nothing about gluten-free baking, I offered to bring cinnamon rolls that everyone could eat. Thanks to this recipe, my reputation remains intact. They were delicious and enjoyed by everyone. thanks for this recipe. i used it as a base for coffee cake. YUM! I think I will be trying these tonight. "anything that smacks of healthy eating" cracked me up. I'm on the hunt to make gf cinnamon buns for my hubs for father's day. Thanks! THANK YOU for your recipe here…my rolls turned out really hard…this was my first gluten free flour making and maybe I did it wrong…also, I live in Germany and getting people to ship me gluten free stuff is hard. (I moved from Tacoma area a year ago) I am hopefully going to be tested this week for the allergy… have you heard of adult onset? I hope you have gotten your answer by now, but just in case… Yes, gluten intolerance can be noticed anywhere from teeny baby age to 90. Now they have a relatively simple blood test to look for the presence of antibodies (make sure they’re checking the total antibody level as well). The biggest test- do you feel better without gluten? Then go for it! I sure need some help from readers, bakers or the gluten free girl herself. I wonder why you distinguish between almond flour and almond meal in your pie crust. I have Bob's as it is all there is locally. I find no difference in the two. Do you write about this? Also, sweet rice flour…is that different from the other rice flours? Where might I find this stuff. I have thought of I have googled and poked around but do not feel educated enough yet about these two flours. So, I tried these for the first time this weekend, and was very disappointed when I tried parchment paper and the dough stuck to it like glue 🙁 After about an hour of booing to myself, I used saran wrap and actually got to eat one of these delicious rolls after about 3 hours of waiting. I substituted tapioca flour for sweet rice flour and arrowroot for the corn flour (my sister is allergic to rice and corn). I was really nervous for my "globs" but I just did a taste test and the dough was DELICIOUS! I am sad that I wasn't able to form rolls but am happy about the resulting taste and also that my sissy will be able to enjoy some bread! So our family has had a tradition of having cinnamon rolls every Christmas for 25 years…until last year, when two of our adult kids discovered they were gluten-intolerant. This year I found your recipe and today made these amazing cinnamon rolls. EVERYONE loved them! Thanks for saving our Christmas family tradition. I am truly grateful!! I made your rolls and commented on my blog! Thanks for the recipe! Thank you for making these, I’m a gluten-intolerant expat American, living abroad for the last 13 yrs, and haven’t made cinnamon rolls since I was a kid, and eaten them since being away!!! I woke up today wanting cinnamon rolls and your recipe was amazing, esp with such detailed, heartwarming instructions! This recipe was FANTASTIC!! I used one of the premade gf flour mixes I have here instead of all of the different flours and it turned out great! I wish I’d iced mine straight out of the oven–so the icing would melt into the folds instead of just sitting on top! 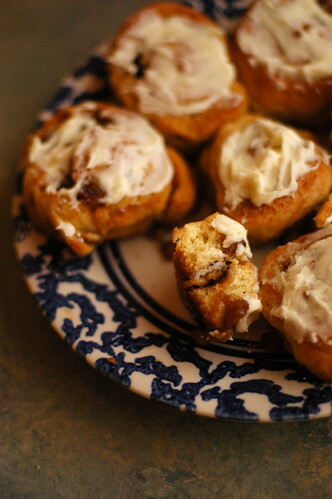 Thanks again for experimenting with so many recipes so that we can have cinnamon rolls again!!! smiles from downunder!!!! My rolls are rising. I expect them to wow my gluten-full family as most of your recipes do. I made your cookie doughs for Santa and relatives this morning, just like I did to raves last year. But I have a request. My family celebrates Santa Lucia Day. My 8-year-old daughter will wake up early to serve us breakfast while singing about bringing light in mid-winter. Before my wheat allergy, I made a family recipe of rolls the night before. Like small cinnamon rolls, but the dough has tang with orange zest and cardamon. I can’t figure out how to get them right in my new universe. I adjusted my spices in your recipe to get the right flavor combo, but I’m looking for a lighter and drier texture like the original. I know it’s too late for this year, but if you’d like a baking challenge before next December 13th. We could really use the help. They’re our holiday roll for the entire month of December. And we miss them. Amy, if you send me the recipe you used before cutting out gluten, I’d be happy to take a try at them! These sound so amazing. I just lost my baby in miscarriage and baking gf cinnamon rolls for Christmas would be so comforting. But I live in Czech Republic and can not find xanthan gum or guar anywhere. Does anyone know if they would work with flaxseed slurry? I’m on my way out the door to find some ground flaxseed. Merry Christmas!! Thank you, Thank you, Thank you. So Grateful. They were delicious. So thrilled to have this recipe for tomorrow morning! Welcome back cinnamon rolls on Christmas morning. I had a little trouble with my first roll sticking to my parchment paper (don’t have a Silpat….yet…) so I VERY lightly buttered the parchment for my second roll – worked like a charm! Came right off very easily. These are beautiful and are rising amazingly well. Can’t wait to savor them with coffee in the morning – and watch my 3 little ones’ eyes light up with delight as they bite into them. Thanks for bringing back a family tradition! I don’t have a silpat, but I need one! I made these and they stuck on my parchment paper (even though I greased it). I got frustrated and just dumped the whole bunch in a 9×13 pan and baked them up. They didn’t look like rolls at all. DELICIOUS !!!!!!!!! My kids, who usually complain when I make something gluten free, said they were great. My daughter who is usually VERY particular said, “These taste just like the ones I like.”. The ones I made pre-gluten free era. Thank you!!!!!!! I’m giving this recipe a try! A few substitutions, the biggest ones being that I don’t have tapioca flour yet and don’t have milk powder on-hand, but hey, it’s a first try at anything with yeast and no gluten, so I don’t have super-high expectations (though I am hopeful that it will be edible) 🙂 I left out the brown sugar and put in cardamom instead because I’m trying to replace my family’s traditional Swedish Coffee Bread recipe with a GF recipe – the regular bread is like a less-sticky-sweet version of cinnamon rolls + cardamom. No doubt it won’t be the same, but hopefully it has a bit of the essence of that bread once I’ve given it a couple or three tries (or more… but since I’m single my waist can’t afford too many tries in close repetition!) 🙂 It’s rising now. Why the milk powder?? just curious. Can’t wait to make these for the 4th of July flag raising. Milk powder adds a certain softness to the dough. You can drop it if you want. But it works! I just made these for breakfast (ok, maybe brunch since it is 11:15…). These are AMAZING and everything I’d hoped for. Thank you so much for this blog, the recipes & inspiring me to embrace my newly gluten free diet! my breakfast was complete thanks to you guys. I got my true cinnamon from here http://www.regenerativenutrition.com/cinnamon-cinnamomum-verum–p-176.asp, thank you again for all the amazing recipes. Thank you so much for sharing this! I generally experiment and create my recipes… I find I have better results that way… but I was having much difficulty with cinnamon rolls… it had stumped me much like it sounds like it had you until this version… I finally got too impatient and decided to look here. I have been inspired by your recipes before and just wanted to say thanks this time! This is what I needed to find!